§ Prophecy is a valid and true means by which God communicates the divine will and intention to people. § Prophecy is a highly ambiguous and dangerous phenomenon and, because of its essential subjective nature, should be treated with a high degree of suspicion in all cases. These views are meticulously intertwined in the narratives about the character of Samuel and both are absolutely central for the meaning of the narrative and of its portrayal of the prophet. From beginning to end, Samuel is clearly understood by the writers as fulfilling the promise of Deuteronomy 18 as the Mosaic prophet, one who serves as the primary intermediary between the divine and human realms. Yet, unlike the sympathetic readings offered by some commentators, Samuel is obviously not an unambiguously positive character. 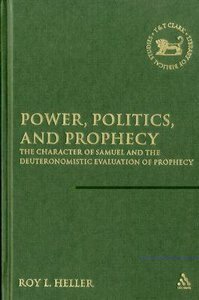 About "Power, Politics, and Prophecy"
Ruth Burrows is a Carmelite Nun from Quidenham in Norfolk, UK. She is the author of a number of bestselling books including Guidelines for Mystical Prayer and Essence of Prayer.